One Manalo Place is one of the newest hotels in Puerto Princesa City which caters to both local and foreign travelers who are looking for an intimate and luxurious accommodation without the upscale price tag. This 47-room property is conveniently situated near the Puerto Princesa International Airport, with restaurants, banks and souvenir shops located within a five minute short drive. The hotel features a Filipino tropical design with a modern-contemporary vibe. We particularly loved the lobby with its white walls and ceiling which give an expansive feeling to the interior, the large windows that allow more natural light into the space and give a feeling of connection to the surrounding landscape, the wave panels on the ceiling mimic the waves of the sea and give a feeling of motion and fluidity, adding fun and excitement to the overall design. The curves of the furniture further pronounces the contemporary feel of the space while brasswork and wooden centerpieces and accents amplify the Filipino character of the design. The hotel's front office handled our check-in quite efficiently. We comfortably waited at the lobby while sipping on our welcome drinks. Before heading to our room, we browsed through a magazine showing some of the attractions in Puerto Palawan City, and we learned from the front office that the hotel can arrange hassle-free tours for its guests such as the City Tour, Underground River Tour, Honda Bay Island Hopping and Firefly Watching River Cruise. From the hotel's lobby, you will pass through the open corridor and garden to get to your room. The open spaces gives an airy feel inside the property while the greens extends Palawan's forest charm into the hotel. We were booked in a Deluxe Room with Lanai during our stay at One Manalo Place. With a total floor area of approximately 24.2 sqm, the Deluxe Room could fit twin beds or a queen bed, a standing closet, a long desk with chair, a luggage rack and an en suite bathroom. The beds have thick mattresses and are topped with clean linens and comforters. Fluffy pillows are smelling clean and fresh. The Deluxe Room is quipped with a window-type air conditioner, an LCD TV with cable channels, an electronic safe, and an electronic kettle. WiFi Internet access is also available inside the room. 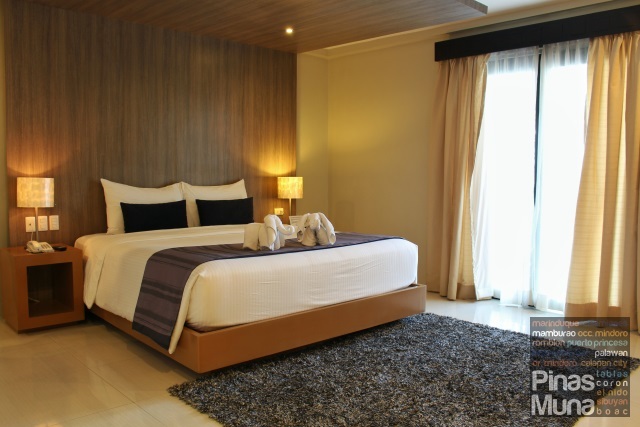 The Deluxe Room can accommodate a maximum of two adults and two children and is ideal for couples and small families. Complimentary bottled water and slippers are provided. The en suite bathroom has a walk-in shower with flooring made of polished round stones. Strong water pressure flows through the shower equipped with heater. The toilet is also equipped with a bidet. Complimentary toiletries include shampoo, conditioner, shower gel, body lotion, soap and dental kits. A less expensive alternative to the Deluxe Room is the Standard Room. Though smaller in size at approximately 19.5 sqm, the Standard Room has the same amenities as a Deluxe Room. For guests requiring much bigger space, One Manalo Place can offer the Suite Room and the Presidential Suite. During our stay, we were able to view a Suite Room. It has a separate living area and bedroom area equipped with an inverter-type air conditioner, an LCD TV with cable channels, an electronic safe and an electronic kettle. The en suite bathroom has a bathtub and the toilet is installed with a bidet. Highlight of the Suite Room is its private veranda facing the pool area. If working out is part of your daily routine, the hotel's air-conditioned fitness center has treadmills, strider, stationary bicycle, and other gym equipment that can surely suit any work-out programs. On a beautiful sunny day, you can choose to laze around the pool area by taking a dip or bask in one of the poolside sun lounger while enjoying a chilled drink. After a long day's tour of Puerto Princesa, having a massage is perhaps the best way to relax your tired body. Nuat Thai, operator of the biggest chain of spas in the Philippines, has a branch located right next to the hotel - Nuat Thai One Manalo Branch. Nuat Thai is one of our preferred spa brands in the Philippines mainly because of the consistency of their service. All Nuat Thai therapist undergo a standard training, so the Swedish Massage that you enjoy in Manila will be the same Swedish Massage you will enjoy here at Nuat Thai One Manalo branch. One Manalo Place in-house guests may choose to have their massage at the comfort of their hotel room. We also noticed that the Nuat Thai One Manalo branch has a more stylish design compared to other branches. They even have free WiFi inside the spa. We recommend the One Manalo Signature Massage (60 mins for P600; 90 mins for P650) a massage uniquely created for the Nuat Thai One Manalo Branch which combines four forms of massage: Swedish, Thai, Reflexology and Shiatsu. If you are a couple, we recommend the Couples Night Out package (P1,450 for two persons) which includes 1-hour Swedish Massage, 30 mins Foot Massage and 30 mins use of Sauna. Nuat Thai One Manalo Branch is open daily from 11:00am to 12:00mn. To book or reserve a schedule, you may call them at 0916-1936081. Aplaya Seafood Restaurant is the hotel's all-day dining restaurant which boasts of their local and international dishes prepared using the freshest of the freshest seafood. Connected to the hotel's lobby and accessible from the pool area, the restaurant caters mainly to the hotel's guests but also welcomes walk-in guests. An overnight stay at One Manalo Place includes complimentary buffet breakfast for two persons served at the Aplaya Seafood Restaurant. Choices include breads, butter & jams, cereals, rice and various local and international dishes. During our stay, we had garlic fried rice, tocino, danggit and beef tapa. We also had free-flowing fruit juices and brewed coffee. Overall, we were very pleased with our stay at One Manalo Place. It has instantly become one of our favorite small-size hotels in the country. We will definitely consider staying here again on our future trips to Puerto Princesa City. For those who will soon be visiting Puerto Princesa and are looking for an affordable luxury accommodation that is centrally located within the city, we highly recommend One Manalo Place.